Most people don’t even know they need an impact driver until they use one for the first time. Then, they’re likely never to want to go back to using a regular drill again. The best impact driver can drive bits and screws through tough materials, like plastic and metal, thanks to their forceful pulses that give you a helping hand. If you’re looking for the best cordless impact drill on the market, our guide should help you find the best one for your projects and budget. We’ve outlined our top five choices based on power, performance, customer reviews, and features offered for the price. 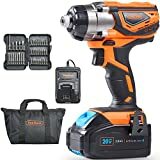 VonHaus 20V MAX Cordless 1/4″ Impact Driver Kit is a powerful impact driver with up to 3,000 RPMs and includes 37 bits and accessories along with a fast-charging battery as part of its kit. 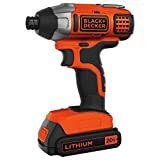 BLACK+DECKER BDCI20C 20V MAX Lithium Impact Driver is a compact tool that is light enough to use with one hand but still delivers 20 volts of power and up to 1,375 in.-lb. of torque. 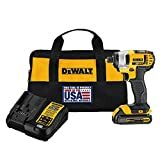 DEWALT DCF885C1 20V Max 1/4″ Impact Driver Kit has an LED light built in for precision driving and easily loads and unloads bits using a one-hand design. 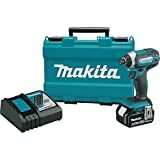 Makita XDT111 3.0 Ah 18V LXT Lithium-Ion Cordless Impact Driver Kit is super lightweight, so it could be one of the best options for long projects to prevent hand pain and fatigue. Ryobi One+ P236 18V Cordless Impact Driver is a budget-friendly option that could work well for people who have smaller projects. Although compact, the 18-volt battery still puts out a good amount of power. Our impact drill reviews go in-depth with our top choices for best cordless impact driver to help you narrow your options. The VonHaus Impact Driver Kit is an excellent option for anyone who doesn’t currently have a full set of bits because the kit comes with 37 bits, the impact driver, fast-charge battery and charger for only slightly more than you can purchase most impact drivers by themselves. The benefit of having an included set of bits is that you’ll know that they fit and work correctly with this driver. You’ll get speeds up to 3,000 RPM with up to 1327 in.-lb. of torque combined with a high-performance motor to deliver the power you need for even the toughest materials and projects. Several customers believe that this kit offers a lot for its price tag. The driver itself is durable and performs well and customers are impressed by its battery life, even when using a lot of torque. The BLACK+DECKER Lithium Impact Driver is one that can fit most budgets, yet packs in a lot of power and performance for its low price. The tool is compact and lightweight enough for comfortable one-handed use. Its small size helps you finish a variety of projects with small footprints, like installing cabinetry in the kitchen. With up to 3,000 RPMs and 1375 in.-lb. of torque, this tool can put bits through just about anything, from hardwood to metal. The quick release hex bit design provides a straightforward process for changing bits quickly. If you own other BLACK+DECKER power tools, this could be an excellent addition to your collection. The battery and charger system is the same that many other of the company’s tools use, so you may have backup batteries that work with this impact driver. Several customers believe this is the best cordless impact drill for small projects and budgets, but some didn’t find that it met their needs for projects requiring a lot of power and torque. If you’re looking for a super compact impact driver to get into tight spaces, the DEWALT may be your best option. Its small head is only slightly larger than the base that holds the battery, and its overall design is light and easy to use one-handed. This tool can work with a variety of materials, but it could work best for wood projects where a lot of screws are required in a quick amount of time. The 20-volt battery delivers enough power to get the job done. You’ll probably appreciate the built-in LED light that comes on when you pull the trigger and stays on for another 20 seconds after release to help you get a precise drive. People who have purchased this impact driver say that it’s one of the best for driving screws quickly for short projects, but several agree that it may not have enough battery power to handle longer projects without a backup. This Makita impact driver is another compact tool that you can control and maneuver easily with one hand, so you can keep your other one free to guide bits and hold materials in place. Even with the battery installed, the tool is less than four pounds. If comfort is what you’re looking for, then the Makita might be the right choice. The grip is rubberized for your comfort during use, and the weight of the base and head balance each other to prevent it from toppling in either direction and causing fatigue. This tool’s chuck really stands out with its one-handed design. You can pull the chuck easily to remove and install a bit, getting you started in seconds. One complaint some customers have is that the trigger is very touchy, making it difficult to control the speed until you get more used to the tool. However, most are thrilled with the battery life compared to other similar impact drivers. The Ryobi One+ is the budget-friendliest option on our list. 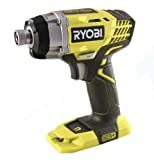 This driver houses an 18-volt battery, so you may not get quite the power out of this tool as you do the 20-volt models, but it could be the best option for people who just need a quicker method of installing screws into wood and other light projects than drilling. A unique feature of this impact driver is its built-in magnetic tray on the base that catches and holds screws as you work, so you don’t have to keep looking for them. You’ll also get a three-beam light fixture that illuminates your work surface as soon as you pull the trigger. A few customers say that they’re impressed with the projects that this tool can handle for its price. Customers have not only used it on wood, but also steel and car projects. Before you decide on the best cordless impact driver, we suggest you check out this helpful guide that explains more about the tools and what to look for. What are the Benefits of Cordless Over Corded? They’re portable. Cordless impact drivers can go wherever you go. You don’t have to worry about finding an outlet to use and purchasing an additional extension cord to power the tool. They can be safer. With no cord following you around, you’re less likely to trip or get tangled while you work. They are usually lighter. Most battery-operated tools use lithium-ion batteries, which tend to be lightweight but still offer excellent power. They can be more compact. Corded impact drivers can be much bulkier than their cordless versions, which can make them more difficult for some people to hold and maneuver. You should consider how easy your impact driver will be to maneuver as you work. Is it lightweight and compact, or is it bulky and heavy? Even cordless impact drivers come in a variety of sizes, and they’re not necessarily a one-size-fits-all tool. Consider your hand strength and size and also the scope of your project before you make a purchase. If your impact driver is too big to maneuver around your project, it won’t help you much. Torque and voltage are two terms you’ll see a lot when researching impact drivers. Voltage refers to the power of the battery. They typically run between 10 and 20 volts in impact drivers. A 10-volt battery may be suitable for quick, small projects that don’t require as much power. A 20-volt battery, in contrast, should be able to drive bits through even the toughest materials. Torque refers to the jolting power that creates the pulses needed to drive bits and screws into a material. You’ll see torque indicated by a number range, like 800 to 1,200 in.-pounds. The higher the voltage of the impact driver, usually, the higher the torque it has. Impact drivers with more torque can force bits and screws through tough materials more readily than those with lower torques. Some impact drivers come in combo kits that include other tools, or they have several accessories, like a tool bag or bit set, that can save you money by purchasing them together. You may not need the extras but, in some cases, the combo kits work out to being more affordable than buying an impact driver on its own. If the package is only slightly more than the single tool and offers some helpful extras, it might be worth considering paying a little extra to get more functionality from your tool. We believe that the VonHaus 20V MAX Cordless 1/4″ Impact Driver Kit is an excellent choice that combines functionality and performance into one handy tool. Although it’s one of the pricier options on the list, it also includes a full set of bits, making it an affordable option for you if you’re purchasing your first impact driver. With its fast charging capabilities, the tool is ready to use when you are. We also like that its trigger isn’t too touchy, so you can have maximum control over its speed. The VonHaus is our choice for best impact driver, but we offered five incredible options on our list that can meet a variety of budgets, so we hope our guide leads you to the perfect impact driver for your next project. Best Places to Buy Power Tools Online – How To Buy Online! What are All the Different Types of Drill Bits?